Picture of Philip Rutter from Minnesota Public Radio. Philip Rutter lives in a simple log cabin in southeastern Minnesota, where he runs a Christmas tree and apple farm. He uses the fuel of the forest to cook his food and heat his modest home, which has no running water. 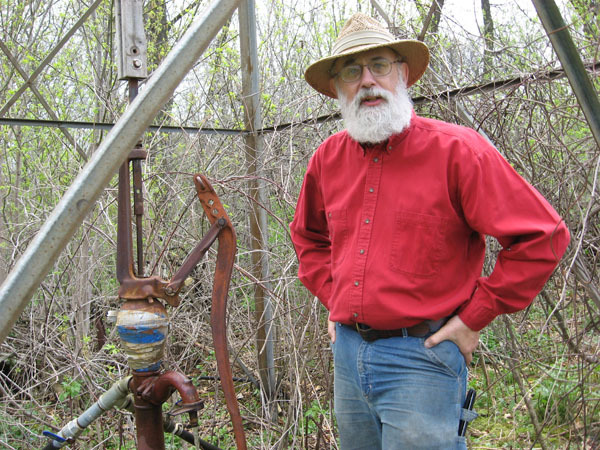 Rutter loves nut-bearing trees, a perennial plant which he sees as having a vast untapped potential to feed much of the world, at much lower environmental costs than intensive cultivation of annual grain crops. He even penned an essay entitled “Why is the Future of the World Nuts?” He believes this tree obsession runs in his blood, as he is distantly related to Johnny Appleseed. “I knew this at a young age,” Rutter confesses, “and it probably served to focus my eyes on plants a little more than most people, and probably gave me an exaggerated sense of responsibility.” As a student at Oberlin College, Rutter studied biology, and then enrolled in a graduate program at the University of Minnesota. But he dropped out after finding his colleagues in the academic world to be too narrow in their intellectual outlook, fiercely competitive, and just generally unfriendly people. Rutter is not growing wealthy on the modest income earned from apples and Christmas trees, but he lives simply, with few expenses, and he pours his surplus money into what has become his life’s passion: restoring the American Chestnut tree, once a dominant tree in eastern forests, laid low by an imported fungus in the early years of the twentieth century. Rutter is just one of the many fascinating characters you will meet when you open up the pages of Susan Freinkel’s American Chestnut: The Life, Death, and Rebirth of a Perfect Tree (University of California Press, 2007). Freinkel recounts the story of this majestic tree in an easy, flowing prose. This is not simply the story of a plant, but a story of the people connected to it. While the book is structured as a historical narrative, it is also great science writing, and non-scientist readers will come away from this work with a clear understanding of the fungus that killed the American Chestnut, and the array of strategies scientists have since employed to try to reverse the devastating blight and return the American Chestnut to the landscape. 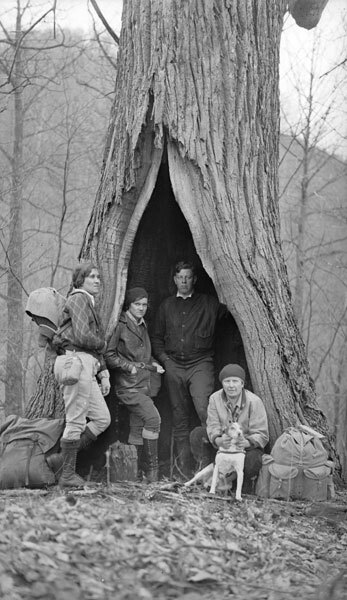 Smoky Mountains Hiking Club in an old Chestnut Tree. The American Chestnut tree dominated large swaths of the forests of eastern North America into the early twentieth century, and the bounteous crop of edible nuts it provided annually were critical to the subsistence of mountain peoples throughout Appalachia. 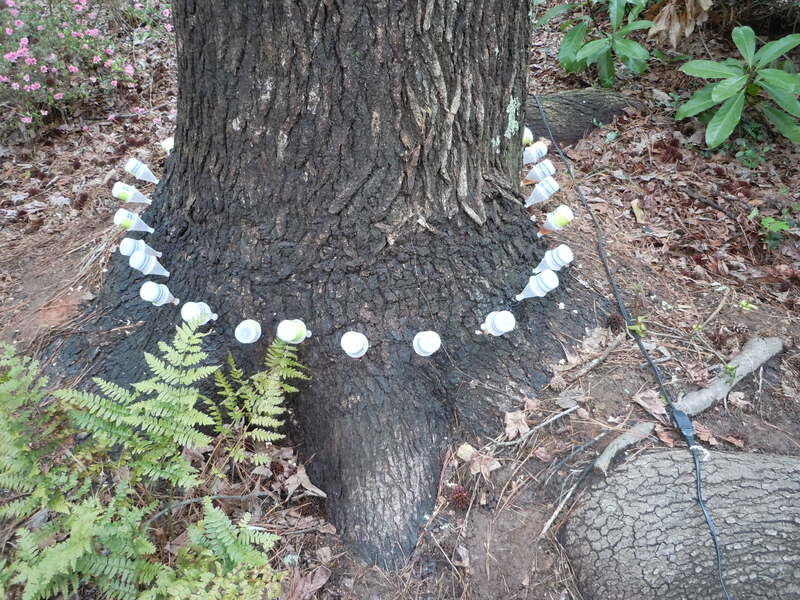 The nuts fed people and fattened hogs, and tree had many other productive uses as well. 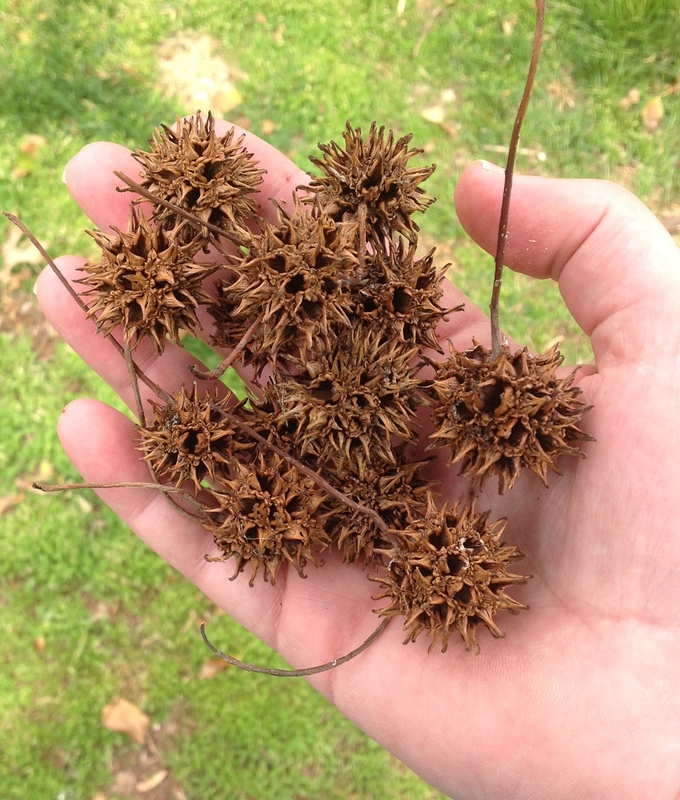 Rutter’s conviction that the perennial crop of tree nuts has the potential to contribute mightily to the global food supply seems not so unreasonable when you begin to understand the invaluable source of sustenance it was to the humans and other animals that occupied the forests of Appalachia in the 19th century. Cryphonectria parasitica, commonly known asChestnut Blight. 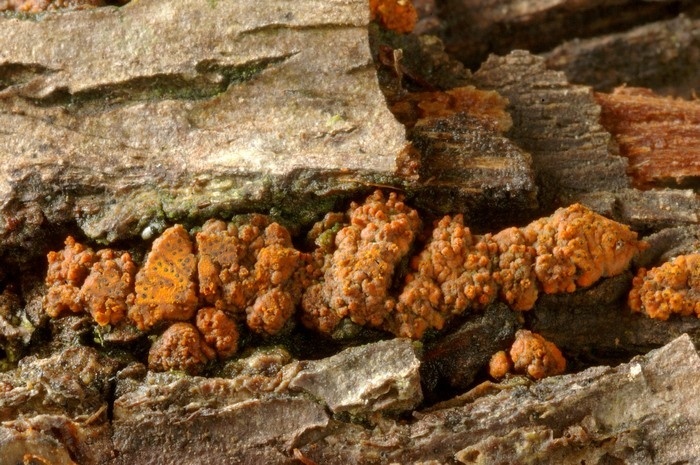 In the first decade of the twentieth century the pathogenic fungus Cryphonectria parasitica arrived on the east coast of North America, probably on the trunks of imported Japanese Chestnut nursery stock. 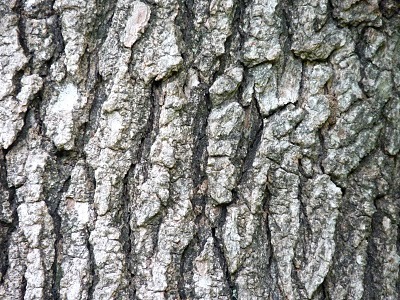 This new blight quickly found a home in the crevices of the American Chestnut tree’s bark, growing at an alarming rate, causing the bark to split and opening so many wounds on each tree that even the mightiest Chestnuts soon succumbed. 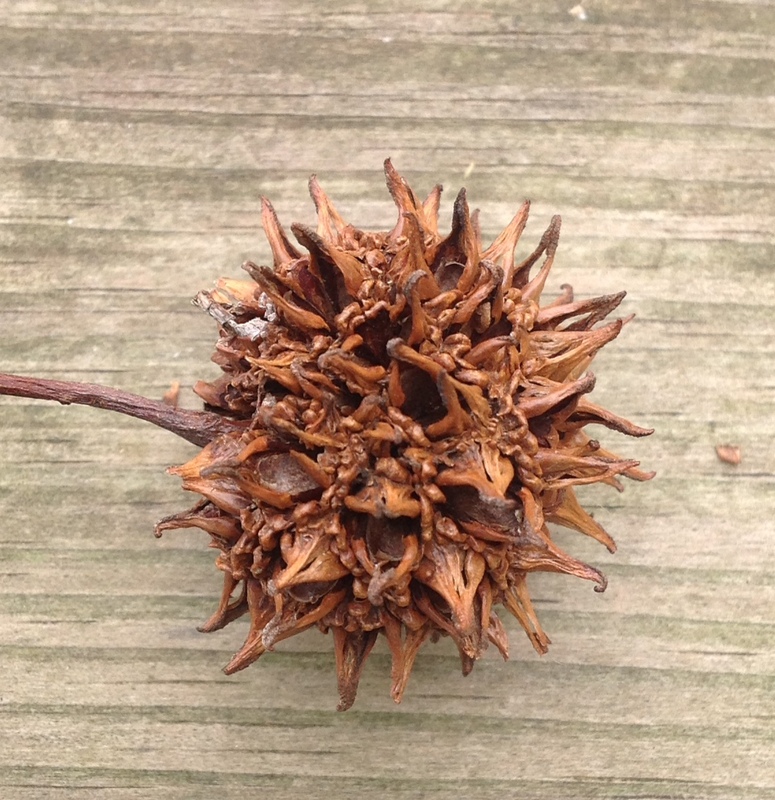 Over the next several decades this aggressive invader, aided by the saws of well-intentioned humans who cleared vast forests of Chestnuts in a futile attempt to arrest its spread, killed three to four billion American Chestnut trees. Billion. Freinkel tries to put those numbers in perspective for us: “Enough trees to fill nine million acres. Enough trees to cover Yellowstone National Park eighteen hundred times over. Enough trees to give two to every person on the planet at that time.” It was a stunning loss. The disappearance of the Chestnut dramatically altered forest ecosystems, and in some places human subsistence strategies, and it occurred in a remarkably short span of time. The American Chestnut was such an important part of the lives of people who lived in its range, that nostalgia for the tree, and the dream of finding a way to restore it have persisted into the twenty-first century. Even in the rural Ohio community where I live old timers still refer to a hill just south of town as Chestnut Hill, a place they retreated with their dates for a romantic picnic, a little privacy, and the opportunity to gather chestnuts. Ever since the blight struck, people like Philip Rutter have been trying to restore it by employing a variety of strategies, from simple Mendelian cross-breeding to more blight resistant Asian Chestnuts, to efforts to disable the killing power of the fungus, to modern bio-engineering methods. 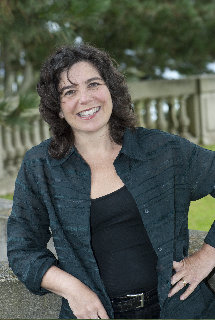 Susan Freinkel has also more recently authored Plastic, a Toxic Love Story. Freinkel does a great job explaining these various efforts, the problems that have confounded the advocates of each, and the progress that has been made to date. But she also employs the story of the American Chestnut to shed light on the changing priorities and values of ecological science, while raising an array of important questions about the idea of restoration ecology, the possibilities and perils of bioengineering, and what limits humans should place on their interventions in the ecological landscapes they inhabit. American Chestnut: The Life, Death, and Rebirth of the Perfect Tree is a smart book and a compelling read. I have decided to assign it in my American Environmental History class next spring. I urge you to pick up a copy.